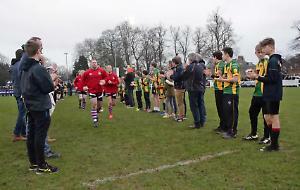 HENLEY HAWKS came out on top in a hard fought, forward dominated game at Dry Leas on Saturday in a contest played throughout in driving rain. Both Henley and Dings Crusaders scored a brace of tries and although the Hawks failed to find the heights of performance from last weeks game at Old Redcliffians, they did enough to ensure victory against a resilient Bristol outfit who will cause other teams problems this season. The Hawks started off well and dominated the early exchanges. They played a quick offloading game with some good driving play from the forwards, particularly Alex Bradley, Tom Emery and Brad Cook. A good surge from the impressive Dave Hyde following an attacking line out allowed Roddy Giles to give the Hawks the lead with a penalty. The Hawks extended their lead shortly afterwards with continual pressure from the forwards and Dave Hyde crashed over for the first Hawks try. Giles converted. When the Crusaders got hold of the ball, the Henley defence was aggressive and the visitors found it hard to get out of their own half but this did result in an injury to Hawks centre Connor Morrison who was replaced by Joe Butler. However, when Dings prop Huw Wilkes received a yellow card, it seemed to revitalise the visitors forwards, who upped their game, and that, along with some over eagerness from the Henley pack, gave Dings momentum to get back in the game. A penalty from Dings Steven Plummer reduced the arrears and then constant Dings pressure resulted in a yellow card for Hawks debutant Juite Tupua and another penalty for the visitors. In their excitement, they turned down the easy kick at goal and kicked for the corner but lost their own line out which bought the half to a close with the Hawks leading 10-3.
Henley started the second half as they had done the first, taking the game to the Crusaders. Good drives from Dave Manning, Alex Bradley and Dave Hyde put the Hawks deep into the Crusaders territory. Good sustained, wet weather rugby by the Hawks forwards enabled Dave Manning to score his teams second try from close range. Giles again converted. Shortly afterwards a good break from Joe Butler almost resulted in another Hawks score for George Wood but he caught just short of the line. With a 17-3 lead, the Hawks faithful expected the home team to pull away but this attack ended up being the last real threat from the home side. Although the Hawks didn’t really look like losing the game, they became jaded at times and allowed the Crusaders to gain in confidence. The Hawks scrum creaked badly at times, as the visitors, with number eight Jake Holcombe in fine form, started to get more possession and camped themselves in the Hawks half. Eventually, Will Capon drove over for Dings first try after some good work from ex Hawks Stean Williams. A mistake by Dings allowed the Hawks an opportunity to keep the visitors at arms length on the scoreboard. Jake Albon secured a line out and Tom Emery’s strong drive won a penalty for Henley which Roddy Giles converted. Back came the Crusaders and just before the end, Jordan Gratton crossed for a try that ensured a well deserved bonus point for the visitors which Steven Plummer converted. This was another victory to follow on from last week for the hosts and coach Luke Allen was philosophical afterwards. Allen said: “It was great to get the four points, and to win to gain momentum and try to make Dry Leas a fortress. “We weren’t quite clinical enough in the second half, they got their tails up and we ended up chasing the game a bit, when we should have been controlling it. It’s a big week for us now so at least it bodes well for our visit to Taunton next week”. The Hawks now lie in sixth position in the table and with just five points separating the top seven sides, there is a real chance for them to establish themselves at the top end of the table and make a statement to the rest of the league. Winning is a good habit but the current Hawks winning run will be severely tested at Taunton Titans. Henley Hawks:15 Finn Pietersen, 14 George Wood, 13 George Griffiths, 12 Connor Morrison (Joe Butler, 14 mins), 11 Juite Tupua, 10 Roddy Giles, 9 Leo Webb, 1 Brad Cook (George Primett, 67 mins), 2 Tom Emery, 3 Dave Manning, 4 Jake Albon, 5 Dave Hyde (Adam Neal, 67 mins), 6 Sam Lunnon, 7 Marcus Lowe (Scott White, 78 mins), 8 Alex Bradley. Replacement not used: Tom Hall.